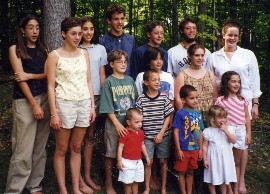 This is a shot of all the cousins on the Heptig side. From top left clockwise Katie Heptig, Amanda Swanson, Elise Heptig, Joe Swanson, Matt Swanson, Big Bro Michael, Emily Swanson, Molly Auger, Meghan Auger, The Chellinator, Sam Heptig, Will Heptig, Luke Heptig, Frank Heptig and Peter Auger. 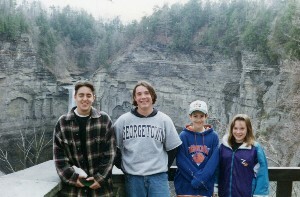 Jay, Michael, Ryan, and Chel on a family vacation in Ithaca, New York. Chel loved her Uncle Philly! This is the Philip in Michael Philip Heptig. Chel had wonderfully infectious belly laugh. Chel and her cousin Elise.